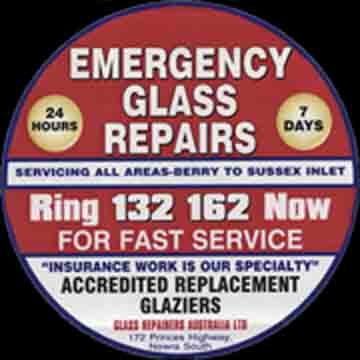 Here is an example of one of our emergency window repair teams in action repairing a large commercial shopfront in Nowra, NSW, Australia. 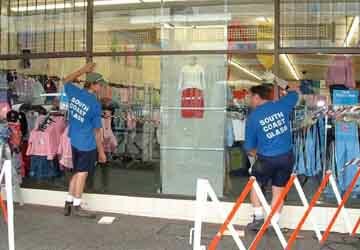 South Coast Glass offers our customers a total domestic and commercial reglazing service 24 hours a day, seven days a week. We guarantee our clientele an efficient, reliable and courteous service. Accreditation Number- 2145, South Coast Glass is the only local glazier accredited with the NSW Glass and Glazing Association and this demonstrates our knowledge in this very specialised industry and our competency in glass selection under the stringent clauses of the safety code. This system was developed to ensure that the Australian Standard was fully understood and implemented by glaziers and to give both architects, designers and customers confidence in there choice of supplier. To gain this accreditation, we have had to participate in training seminars and pass knowledge tests of competency in the relevent Australian Standard. This accreditation is reviewed and renewed annually by our NSW industry association to ensure an up-to-date understanding of the frequently changing standards requirements. South Coast Glass is also participating in a three year Occupational Health and Safety Management scheme. All of our tradespersons have completed Workcover NSW OH&S Induction Training for Construction Course in accordance with the OH&S Regulation 2001 and hold certificates pertaining to their achievement. South Coast Glass considers this knowledge crucial in ensuring the safety of not only our employees, but also our clients and the general public that often frequent the areas immediate to our sites.